The art of topiary is a skill perculiar to the gardener, who, armed with shears and patience, gives shape to the plant. In Eyrignac, the art of topiary has found a place where there are no limits to its forms of expression. Spheres, pyramids, cones, straight hedges, green rooms, patterns of boxwood, animals and many other motifs punctuate the visit to please the eye and fuel the imagination. The gardens at Eyrignac are an open-air museum where the creations of Nature by craftsmen are exhibited. Sculpting plants is a practice recognised since antiquity and has been used in all styles of gardens, whether medieval, Italian, French, English or contemporary. “Topiarius” was the title given by Pliny the Younger to the gardener in charge of the embellishment of the Ornamental Garden. “Ars Topiaria” or ‘Topiary Art’ is the skill of selecting plants that lend themselves to geometric forms or free forms in three dimensions. Techniques differ, depending on the plants in question. Shrubs such as yew, box and cypress, or trees like elms and hornbeam are trimmed with shears, using string, plumb lines and stencils. Climbers such as ivy, for example, are trained either on trellises to cover a wall or on structures formed to represent an object or an animal. With no less than 300 topiaries at Eyrignac, the art of topiary takes pride of place. The range of motifs are infinite thanks to combinations of the basic geometric shapes : sphere, cube, cone, pyramid, and spiral, allowing the gardener to achieve decorative elements of any size ; in fact actual green structures. 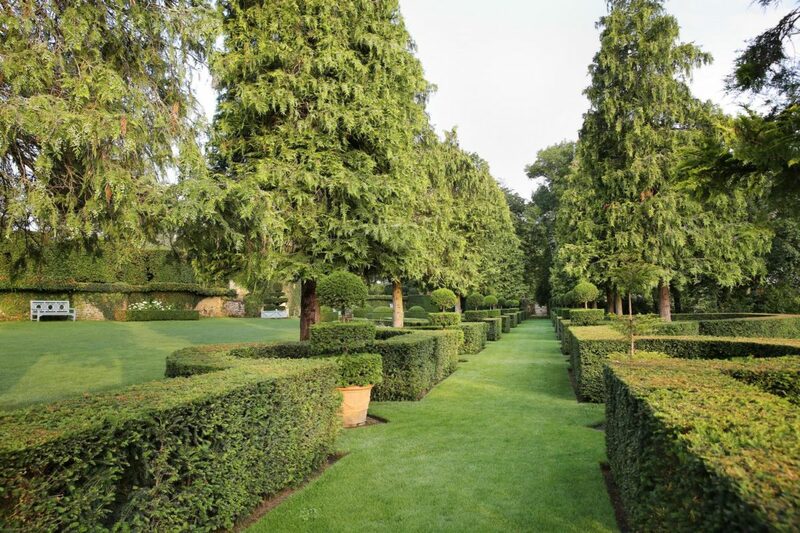 The examples of topiary at Eyrignac are identified as sempervirens (always green) and therefore provide year round interest. Visitors can appreciate the skill of the gardeners when they pass the evenly clipped hedges lining the path to the Pagoda ; in the topiary garden and in the parterres of the French-style garden. The skills of the gardener are also evident in the plant-covered wall by the fish pond and in the star-shaped green specimens surrounding the water features in the Rose Garden. In the flower meadow, the gardeners have allowed their imagination to create the illusion of a charming ‘green’ farmyard. Everything in the gardens at Eyrignac evokes the tradition of the French-style garden which is based on a subtle balance between precision, harmony and spectacle. 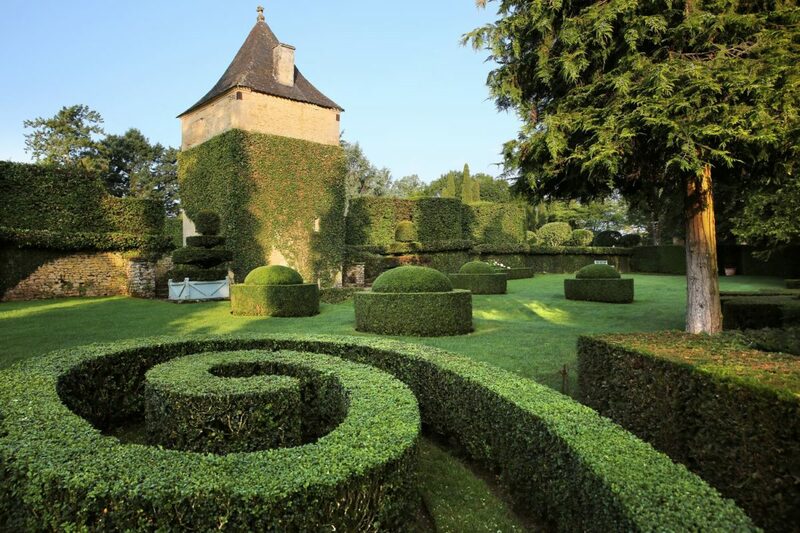 The art of topiary, as it is practiced in Eyrignac, is the perfect fusion of these three principles. Do you have the necessary know-how for topiary? and perseverance, because Nature is quick to revert, so even when the desired shape is achieved the work is not finished. It is necessary to maintain the shape of the topiary by clipping it several times in the year, between April and June and then again between August and October. Periods of intense cold or intense heat are not favourable for clipping topiary because both promote disease and weaken the tree.